Chicken coop designs can be complicated to simple, If you are unsure about your construction abilities make sure you choose a plan that's simple and easy to build. How many chickens do you want in your flock? I have found that its just as easy to raise two or three chickens as it is 10. I love having a lot of different chicken breeds. They are soooo... entertaining. If you have had a stressful day at work there's nothing better than sitting on your deck or patio and watching these characters. should be 10 to 15 square feet per chicken. The more the better. Chickens need and love lots of light. If possible try to locate your windows facing to the South. Sometimes this is not possible so if you can't do this don't sweat it. Having a light in your coop is a nice option if you can afford to do this. This not only provides more light, especially on short winter days, but helps to provide some heat. You must determine according to your climate conditions if you should insulate your chicken coop. Just remember chickens hate to be damp and cold (old wet hen). Also, some chicken breeds are more hot or cold tolerant than others. This could also be a determining factor. When you choose your location for your chicken coop make sure you have firm soil and the area does not flood. 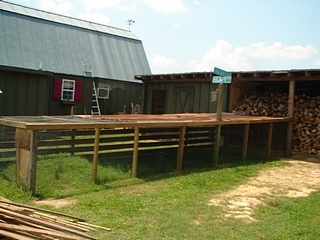 When I built my chicken coop I went overboard (as I seem to always do). I did not want to worry about any predators being able to kill my chickens. So I buried my chicken wire around my chicken run 12 inches deep. (In some areas of the country it's not a bad idea to run a strand of electric wire around the perimeter of the chicken run.) I also covered the top 2/3's of the run with tin and the remaining 1/3 with chicken wire. I know when I go to sleep at night I have done everything possible, with-in reason to keep my little chickie dees safe. If you have the opportunity to add water and electricity, do so. This will be a nice little luxury. You will not regret it. Adding a small amount of space to store your feed, supplies, and misc tools such as brooms and rakes is a nice option. This usually applies to the medium to large chicken coops. 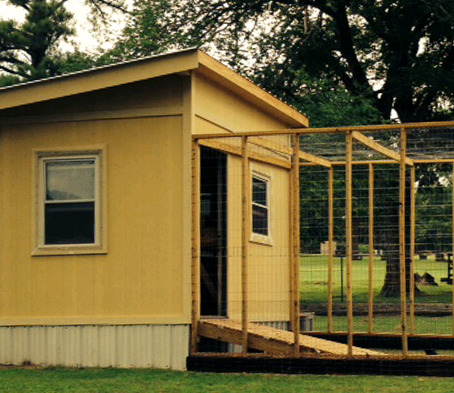 Choose from chicken coop designs that allow for easy cleaning and maintenance. I used concrete for my floor and sloped it toward the door so when I washed it the water flowed out. I also, built my perch so I could lift and tie it off. This allows me easy access underneath to clean out the chicken manure. If you design your chicken coop so that it is easy to clean (deep litter method or sand floor method), you will find that you will clean it more often. This will help to keep chicken diseases at bay, and provide for a nice healthy environment. If you have a wood floor try to cover it with a piece of sheet vinyl. Run the vinyl up the sides of your coop about six inches. 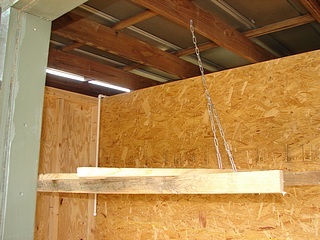 Chicken feeders and chicken waterers should be suspended 6 to 10 inches off the ground. This helps to keep them clean. Those chickens sure can scratch. If you added water to your coop an automatic waterer may be a nice addition. 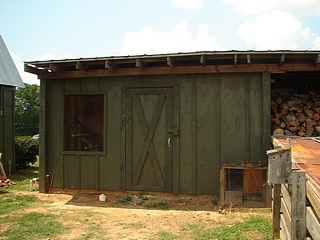 By the way, do you need quality chicken coop plans to help get your coop in motion? I encourage you to click here and discover what I found out when I reviewed 2 different plans that are available.